Few people can tell the difference between a ceramic or a porcelain tile, largely because very few people actually know or understand the differences between the two. If you’re considering a ceramic tile for your home, and want to know if you should spring for the porcelain instead, then you’d better know and understand the similarities they share and the differences they don’t. “Wait, what?” Confusing as it may sound, porcelain tile is technically a type of ceramic. This is due to what constitutes a ceramic tile; a ceramic tile is made from a mixture of clays and other materials hardened under heat in a kiln. 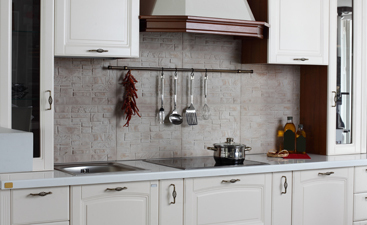 Porcelain, by comparison, is a ceramic tile made from porcelain clay, known for its finer nature than other clays; this type of ceramic requires a higher heat to reach the desired hardness, which requires a higher temperature to properly fire. 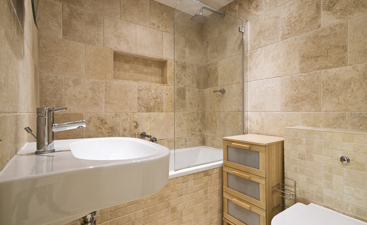 Standard ceramic tile is great for those on a budget. For many of the same benefits that porcelain provides, ceramic can be used at (typically) less cost. Ceramic is especially great for DIY enthusiasts, as it is far easier to work with. Porcelain tile is much harder than ceramic tile (which is itself considerably harder than other flooring types), making porcelain difficult to cut through with non-professional tooling. The benefits porcelain has makes many people appreciate it, even at a higher price point than ceramic. 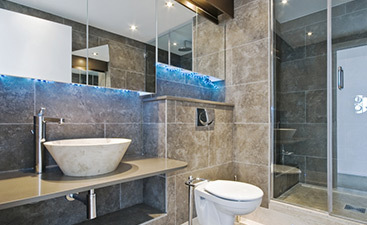 Porcelain is fantastic for areas that will be exposed to routine moisture, such as bathrooms or patios. In fact, porcelain tiles are one of the only tiles that can work as a patio option in most climates. This tile choice is also advantageous over ceramic for high traffic areas, as it is not as reliant upon a glossy coating to create and maintain a smooth glossy surface. Far more than they have differing benefits, the two choices enjoy many more shared benefits. The benefits of choosing either type of ceramic tile include incredible longevity, nearly any style or design, affordability, and application versatility. Both can be made into nearly any color or shape; this includes things like a hardwood look, imitating other stone tiles, or even wildly colorful traditional designs. Ceramic tile has been used for thousands of years to make designs of nearly all shapes and sizes, with tiles in just about every texture and type imaginable. Both of these tile types can fill a number of potential roles in your home and are sure to last for many years. Whether you’re looking at porcelain, ceramic, or both, head into Transworld Tile today for the best selection of kitchen, bathroom and floor tiles available in the San Fernando area. Our experienced tile professionals are excited for the opportunity to help you pick the tile that will best fit your home’s needs.